Everyone needs a little magic in his life. So come join us at the Jean Cocteau next week, for MAGIC & MYSTERY WEEK. Starting this Friday, the whole week will devoted to wizards, sorcerers, illusionists, and practitioners of the dark arts (like screenwriting). For starts, we have three movies opening. DESPERATE ACTS OF MAGIC is a delightful new romantic comedy about magicians. THE PRESTIGE... well, what can I say? Based on the novel by Christopher Priest, this tale of a bitter feud between two rival magicians is becoming a classic, and may well be the best film about the world of magic ever made. Directed by Christopher Nolan, adapted from the novel by Jonathan Nolan and Christopher Nolan, it stars Hugh Jackman, Christian Bale, Scarlett Johanssen, and Michael Caine. And, for our midnight shows, we have THE RAVEN, Edgar Allen Poe by way of Roger Corman, starring Vincent Price, Peter Lorre, and Boris Karloff. (Yes, and Jack Nicholson, believe it or not). The movies are just part of Magic and Mystery Week, however. 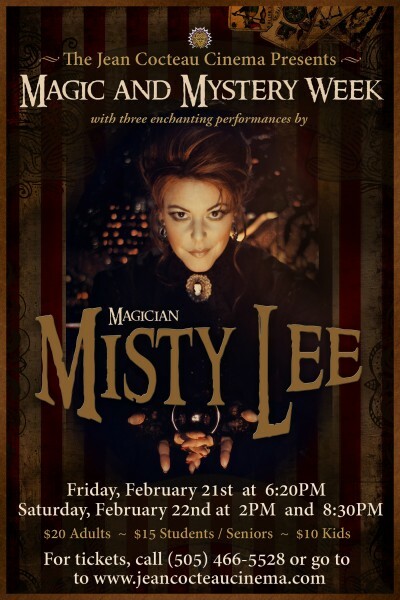 We also thrilled to present the first live-in-person magic ever offered at the Jean Cocteau: three performances by the Amazing MISTY LEE, straight from LA's famed Magic Castle. Misty will be performing three shows only, so be sure to catch them if you're in the area. 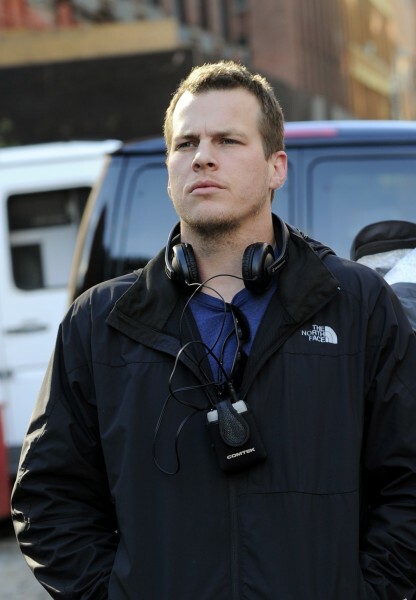 And last, but certainly not least, on Sunday February 23, we will be joined at the Cocteau by JONATHAN NOLAN, screenwriter on THE PRESTIGE and MEMENTO, showrunner on PERSON OF INTEREST, and all around terrific talent. Jonathan will be introducing THE PRESTIGE and answering questions about the film... and he and I will also be doing a dialogue about scriptwriting and adaptation on Sunday afternoon. Should be fun. Advance tickets to the movies, the magic shows, and the dialogue are all available on the Cocteau website. So come join the fun. We promise not to saw you in half. Oh man, The Raven is one of my all-time favorites! The Raven is one of my all-time favorites! Indeed, I have a VHS copy of it. In that huge dusty pile of those things I collected in the 80's. I recall first watching it as a kid on TV over 5 decades ago. Every time I see these Cocteau updates I wished I lived in Santa Fe! Very envious. I wish to be there! So sad that I live at Spain. I love The Raven for ever!! (Yes, Jack Nicholson is acting at that movie so young!!!). It would be fantastic to see this film at a theater. But I also liked a lot Memento and The Prestige. Ya gotta put 7 Faces of Dr. Lao on your wish list somewhere. Do you have a suggestion/request box like the beloved old Clark? We do. Right up near the ticket counter. The prestige is an amazing movie. Tesla! I haven't read the book but was told it was altered significantly for the movie. Such great lines from the movie. "The audience knows the truth: the world is simple. It's miserable, solid all the way through. But if you could fool them, even for a second, then you can make them wonder, and then you... then you got to see something really special... you really don't know?... it was... it was the look on their faces..."
"You're a magician, not a wizard." Still like knowing what's UP! Hi George, even though I am not a New Mexican I still like updates on what you are doing and any news you share. "Magic & Mystery" week at the Jean Cocteau sounds super fun! I LOVE The Prestige. Great film, great acting, great actors, great writing...just great! Thanks for keeping your fans posted on the latest. Don't suppose you are coming to New Zealand any time soon? I was just there in November. now that you are speaking of magic - Beside Dragons and the Others of course which are more like species - Magic seems to gain more and more power since the Dragons are back. So will there be more of it in "The Winds of Winter" for example used by Red Priests? By the way, "Prestige", is great, so impressive and with surprising tournaments - and an excellent cast! "Raven" is the best amongst all others. All the movies about show magicians are supposed to be non-fantasy, but in fact, most of tricks are too naive and not applicable to real life. I liked "Now You See Me" though, because of a perfect feeling of freedom it gave. It turned into a movie I found myself liking a lot more than expected. Definitely one of my favorites. The Raven is something I will watch in my spare time when I find it. The Prestige is an awesome movie, one of my favourites. Any chance on a Ralph Bakshi film festival? Lots of great work, love the rotoscope. Also, he has one titled Fire and Ice: it would be a crime not to. And he totally rocks the beard. Jonathan Nolen at the Cocteau..